I appreciate that you are paying proper respect to Valentine’s Day’s only redeeming element ( or should I say “International feel-sad-for-single-people day”…sheesh!) 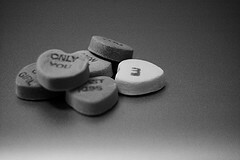 In terms of candy heart quips, how about “ridin solo” or “one for the money” (too long?) or “good enough” or “expensive and hard” (rather than cheap and easy…get it?…sigh). I don’t seem to be struck by a bolt of genious tonight.